TO CHEW ON: "Therefore, when you do a charitable deed, do not sound a trumpet before you as the hypocrites do....And when you pray, you shall not be like the hypocrites.... Moreover when you fast, do not be like the hypocrites...." Matthew 6:2a, 5a, 16a. What is this hypocrite business Jesus so condemns here? "In Bible days actors wore masks, which included mechanisms for amplifying the voice. Since the dramas were questions and answers, the word describing the dialogue was hupokrinomai, to reply or to answer. Hupokrites is one who is playacting, reading a script, or one who puts on an act. The hypocrite conceals his true motives under a cloak of make-believe" - New Spirit-Filled Life Bible, p. 1299. Our modern definition bears out the above. My dictionary defines "hypocrite" as one who practices "hypocrisy: The pretense of having feelings or characteristics one does not possess, especially the deceitful assumption of praiseworthy qualities; insincerity; masking or disguising one's true nature." Jesus puts His finger on three practices the Pharisees of His time performed with insincerity. While charitable deeds, prayer, and fasting are all things easily performed in secret, they made sure everyone noticed a good work was about to be performed by sounding a trumpet. They prayed prominently in the synagogue or street corner where they were sure to be visible. When they fasted, their facial expressions broadcast to everyone that their stomachs were empty. They had corrupted these practices which were meant to minister to God, into advertisements for themselves and their piety. Do we ever playact in a similar way? Oh, it may not look exactly the same but any act that should be God-directed but we're using to get something for ourselves is hypocritical. We volunteer at the mission and love the admiration we get for it. We give, and enjoy our reputation for being generous. We bless and encourage others with the real view to get them to reciprocate. We may get what we want. But that's the extent of it. We have our reward. PRAYER: Dear God, please help me to recognize the hypocrisy living in me. I repent of hypocritical, pride-inspired actions. Help me to do my acts of devotion secretly, for the right reasons, and for Your eyes only. Amen. "In Western Christianity, Ash Wednesday marks the first day, or the start of the season of Lent, which begins 40 days prior to Easter (Sundays are not included in the count). Lent is a time when many Christians prepare for Easter by observing a period of fasting, repentance, moderation and spiritual discipline. 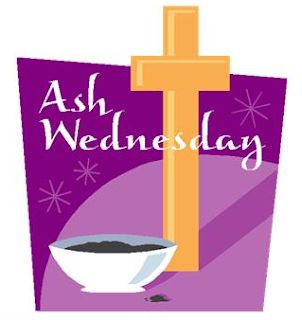 During some Ash Wednesday services, the minister will lightly rub the sign of the cross with ashes onto the foreheads of worshipers." "I did the best I could"